Jim Norton was born Dublin in 1947, where he currently lives. He has been writing haiku and related poetry and prose for several decades, contributing to leading journals internationally. His journal Haiku Spirit is widely acknowledged as a pioneering venture in the development of the form in Ireland in the 1990’s. His second collection The Fragrance of Dust (Alba Publishing) was published in July 2012 to critical acclaim. In recent years as co-founder of the Red Thread group he has made a significant contribution to the development of the prose form of haiku known as haibun. He is currently active in applying the zen-inspired principles of haiku to photography. (Visit www.waywards.ie for a selection of his work and related activity). Now retired from a career as a care worker in the horticultural therapy field, he works as a volunteer in a community garden and teaches meditation at the Shambhala Buddhist Centre in Dublin of which he is a founder. You can listen to Mark and Eric’s performance here. Mark Roper is an English-born poet and editor now living near Piltown, in Kilkenny. He studied at Reading and Oxford Universities. His poetry collections include The Hen Ark (Peterloo/Salmon 1990), which won the 1992 Aldeburgh Prize for best first collection; Catching The Light (Peterloo/Lagan 1997); a chapbook, The Home Fire (Abbey Press 1998) and Whereabouts (Peterloo/Abbey Press 2005). He was Editor of Poetry Ireland for 1999. Even So: New & Selected Poems was published in Autumn 2008, a new collection, A Gather Of Shadow, in Autumn 2012, both by Dedalus Press. The River Book, a collaboration with photographer Paddy Dwan, was published in 2010. A new book by the pair, about the Backstrand in Tramore, is due to be published in Autumn 2013. The Invader, an opera by Eric Sweeney with a libretto by Mark Roper, is scheduled for performance in May 2014. A Dubliner by birth, Eric Sweeney has lived in Waterford since 1981 where he was Head of Music at Waterford Institute of Technology until 2010 . Previously he lectured in music at the Dublin College of Music (now Dublin Institute of Technology) and at Trinity College. He was Choral Director at RTE from 1978-1981. A frequent visitor to North America he has been composer-in-residence at the Newport Festival Rhode Island, Memorial University, Newfoundland, the University of Illinois, Indiana State University and the University of Portland, Oregon among others. His many works include Dance Music commissioned by The Royal Philharmonic Orchestra, the cantata Deirdre commissioned by RTE (the Irish national radio and television network) Figurations for Guitar commissioned by the Spanish Cultural Institute and Music for a Festival commissioned by Festival International de Musique Universitaire, Belfort, France. Recent projects include the Mass of St Patrick and the Evening Canticles commissioned by St Patrick’s Cathedral, Dublin, Slow Air, commissioned by the European Union Chamber Orchestra, and the cantata Hymn to Gaia, a setting of texts from Muslim, Buddhist and Native American sources, together with a range of eco-poetry reflecting on our relationship with the environment. You can listen to Proinsias’ reading here. Proinsias Mac a’ Bhaird is from Árainn Mhór island in the Donegal Gaeltacht. He divides his time between the island and Letterkenny where he teaches history and Gaelic in Coláiste Ailigh, an Irish language secondary school. He also teaches in Coláiste Árainn Mhór during the summer months and plays the bagpipes with the island’s pipe band. The culture and heritage of the island have been a constant inspiration to him and feature widely in his work. Proinsias has published two books of Gaelic poetry, Faigh Greim ar an Ghrian (Coiscéim, 2010) and Idir Beocht agus Beatha (Coiscéim, 2004) and he has been widely published in literary magazines and anthologies. He won the Colonel O’ Neill poetry prize in 2010 and was shortlisted again in 2011. He has also been shortlisted for the Strokestown international poetry prize. In addition to poetry, he has published two full length novels for adults, two children’s books, a collection of short stories and a collection of folklore from Árainn Mhór. He has also written songs and plays for young adults. He has won many prizes at the annual Oireachtas literary awards for his prose, drama, short stories and song writing. Is as Árainn Mhór i nGaeltacht Thír Chonaill do Proinsias Mac a’ Bhaird . Caitheann sé a shaol idir an t-oileán agus Leitir Ceanainn, áit a mhúineann sé Stair agus Gaeilge i gColáiste Ailigh. Tá baint mhór aige le Coláiste Árainn Mhór agus seinneann sé na píobaí móra le banna ceoil an oileáin. Tá cultúr agus oidhreacht an oileáin ina inspioráid seasta do agus is iad ina gné tábhachtach dá chuid oibre. Tá dhá chnuasach filíochta scríofa ag Proinsias, Faigh Greim ar an Ghrian (Coiscéim, 2010) agus Idir Beocht agus Beatha (Coiscéim, 2004) agus foilsíodh dánta dá chuid go fairsing in irisí liteartha. Bhuaigh sé Comórtas Filíochta an Choirnéal Uí Néill sa bhliain 2010 agus cuireadh ar an ghearrliosta arís é sa bhliain 2011. Bhain sé an gearrliosta amach do dhuais idirnáisiúnta filíochta Bhéal Átha na mBuillí freisin. Chomh maith le filíocht, tá dhá úrscéal do dhaoine fásta, dhá úrscéal do dhaoine óga, bailiúchán gearrscéalta agus bailiúchán béaloidis i gcló aige. Tá amhráin agus drámaí scríofa aige agus go leor duaiseanna bainte aige ag comórtais an Oireachtais dá shaothar. Susan Millar DuMars has published three poetry collections with Salmon Poetry, the most recent of which, The God Thing, appeared in March, 2013. She also published a book of short stories, Lights in the Distance, with Doire Press in 2010. Her work has appeared in publications in the US and Europe and in several anthologies, including The Best of Irish Poetry 2010. She has read from her work in the US, Europe and Australia. Born in Philadelphia, Susan lives in Galway, Ireland, where she and her husband Kevin Higgins have coordinated the Over the Edge readings series since 2003. Paul Kane has published five collections of poems: The Farther Shore (Braziller, 1989), Drowned Lands (University of South Carolina, 2000), Work Life (Turtle Point Press, 2007), A Slant of Light (Whitmore Press, 2008), and The Scholar’s Rock (Otherland Publishing, 2011: a Selected poems in Chinese translation); two editions with The Library of America, Ralph Waldo Emerson: Collected Poems and Translations (co-edited with Harold Bloom) and Emerson: Essays and Poems; three anthologies, including Poetry of the American Renaissance; a critical study, Australian Poetry: Romanticism and Negativity; two collaborations with the photographer William Clift, A Hudson Landscape and Mont St.-Michel & Shiprock, and, most recently, a poetry/music CD, Seven Catastrophes in Four Movements (Farpoint Recordings) with Irish sound artist Katie O’Looney. His poems have appeared in Poetry, The Paris Review, The New Republic, The New Criterion, Grand Street, The Kenyon Review, Verse, and elsewhere. He serves as poetry editor of Antipodes; as Artistic Director of the Mildura Writers Festival in Australia; as General Editor of the Braziller Series of Australian Poets; and as Poet Laureate of Orange County, NY. 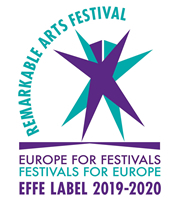 Awards include fellowships from the National Endowment for the Humanities, the Mellon Foundation, the Bogliasco Foundation, and the Guggenheim Foundation. He has taught at Yale University and Monash University (Australia) and currently teaches at Vassar College. You can listen to both rounds of the slam right here. Seán Dennehy is a Clare poet living and working in Dublin. Focusing on the spoken word and performance poetry he has performed at various nights in the city such as The Last Wednesday series and The Monday Echo. In November 2012 he was crowned All Ireland Poetry Slam Champion in Cypress Avenue in Cork. In September 2013 he will be launching his first collection in print entitled No Poetry as part of a series of pamphlets from QS Press. Michael O’Loughlin was born in Dublin in 1958 and studied at TCD. He lived abroad for many years before returning to Ireland ten years ago. He has published five collections of poetry, including Another Nation: New and Selected Poems (New Island Press, 1996) and In This Life (New Island Press, 2011). In addition, he has written screenplays, stories, essays and published many translations, including Hidden Weddings: Poems of Gerrit Achterberg. He has been Writer in Residence in Galway City and County, and Writer Fellow in Trinity College Dublin. You can listen to Julie’s performance here. Julie Field (a.k.a. Julie Goo) is a Cork-born performance poet, singer, and songwriter who writes and performs in both English and Irish (Gaelic). Having been involved in theatre for most of her life, she performs her socially conscious, politically driven poetry with ease and grace. Julie studied at University College Cork for many years, where she completed an MPhil in modern Irish, and also taught. She performs regularly around Ireland, and is currently completing training to teach primary school children. Julie has been selected to represent Cork in the 2013 Poetry Twinning exchange with Coventry. You can listen to Cathal’s performance here. Cathal Holden is a young poet and musician from the Dingle Peninsula with an innovative style. The current Munster Slam champion, he combines elements of hip hop with performance poetry and draws from a broad range of inspirations, from Saul Williams to Kahlil Gibran and from Dahl to Dali. A lyrical storyteller, his work is bound together by the underlying theme of magic. You can listen to the contributors’ reading here. For the guest poet part of the evening, about twenty contributors to I Live in Michael Hartnett, a collection of poems in Celebration of Michael Hartnett (Limerick Writer’s Centre, 2013), will read their poems from the collection. Poets confirmed to read on the night thus far include Pauline Fayne, Valerie Sirr, Joe Horgan, John W.Sexton, Dolores Holman, Doireann Ní Ghroífa, Gréagóir O Dúill, Hugh McFadden, Donal O’Flynn, Paul Ó Colmáin, Jo Healy, Catherine McCarthy, Carmel Cummins, Dominic Taylor and Teri Murray. 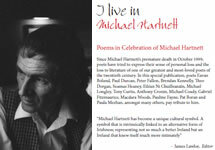 The later open-mic will be dedicated to poems written by Michael Hartnett. From the back cover: Since Hartnett’s premature death in October 1999, poets have tried to express their sense of personal loss and the loss to literature of one of our greatest and most-loved poets of the twentieth century. In this special publication, poets Eavan Boland, Paul Durcan, Peter Fallon, Brendan Kennelly, Theo Dorgan, Seamus Heaney, Eiléan Ní Chuilleanáin, Michael Longley, Tony Curtis, Anthony Cronin, Michael Coady, Gabriel Fitzmaurice, Macdara Woods, Pauline Fayne, Pat Boran and Paula Meehan, amongst many others, pay tribute to him. You can listen to Andy and Rachel’s performance here. Andy Jackson‘s first full-length collection of poems Among the Regulars (Papertiger 2010), was shortlisted for the NSW Premier’s Poetry Prize, the Kenneth Slessor Prize and was Highly Commended in the Anne Elder Award. His poem Secessionist won the 2008 Arts ACT Rosemary Dobson award for Best Unpublished Poem. In 2009, he and Rachael Guy won the Most Innovative Work award at the Overload Poetry Festival for their poetry-puppetry collaborative performance Ambiguous Mirrors. Andy was an Emerging Writer in Residence at the Katharine Susannah Prichard Writers Centre in Perth in 2010. He received grants for poetry projects from Australia Council in 2004 and 2008, and from ArtsVictoria in 2008 and 2011. In late 2011, he was an Asialink literature resident Asialink literature resident at the University of Madras, in Chennai, India, with the support of the Australia-India Council, where he began a series of poems exploring the personal stories behind the medical tourism industry. Widely published in journals, he has performed at the Tasmanian Poetry Festival, Queensland Poetry Festival, Castlemaine Festival, The WheelerCentre, La Mama Theatre (Melbourne) and Prakriti Poetry Festival (in India). In earlier work self-published, Andy showed a delicacy of touch and a subtle humour. Now in Among the Regulars, Andy Jackson’s poetry explores embodiment, identity and difference. He has a genetic condition called Marfan’s Syndrome with an obvious spinal curvature, about which he speaks and writes openly. Rachael Wenona Guy is a multi-disciplinary artist who makes visual theatre with puppetry. She has also worked as theatre professional for the past decade as a performer/singer and writer in the field of contemporary, experimental music theatre. Most recently she has worked as an arts worker with Arts Project Australia, assisting and facilitating art making with artists with intellectual disability. Currently the recipient of an Australian Postgraduate Award, she is completing a Masters Degree in Theatre Performance at Monash University, investigating anthropomorphism, trangression and puppetry. As a singer, Rachael has featured in major festivals across Australia in productions by Ihos Opera and Skadada Multi-artform Circus Company. In 2003 she appeared at the Shanghai International Arts festival as singer and Master of Ceremonies in Skadada’s Electronic Big Top. In 2009 Rachael collaborated with Andy Jackson on a poetry/puppetry work Ambiguous Mirrors which featured at Overload Festival 2009. In 2012 the first iteration of Rachael’s full-length solo work Hutch premiered at TheTarrengower Puppetfest in Central Victoria. This piece was staged underground in a disused gold mine and combined live music, puppetry and physical theatre. Other projects and awards include the 2008 Sir Rupert Hamer Scholarship for postgraduate study in the arts; an Australian Council Community Partnerships Grant in 2011-12 to facilitate a year-long series of puppet making workshops as artist in residence at Arts Project, a studio for artists living with a disability; and in 2010, ArtsStart, an Australia Council grant to assist in establishing a studio-based puppetry practice.